The Ski Buses transfer between the main slopes and the major accommodation areas. There are two routes which connect at the Zero Point building at the foot of the Front Slopes. 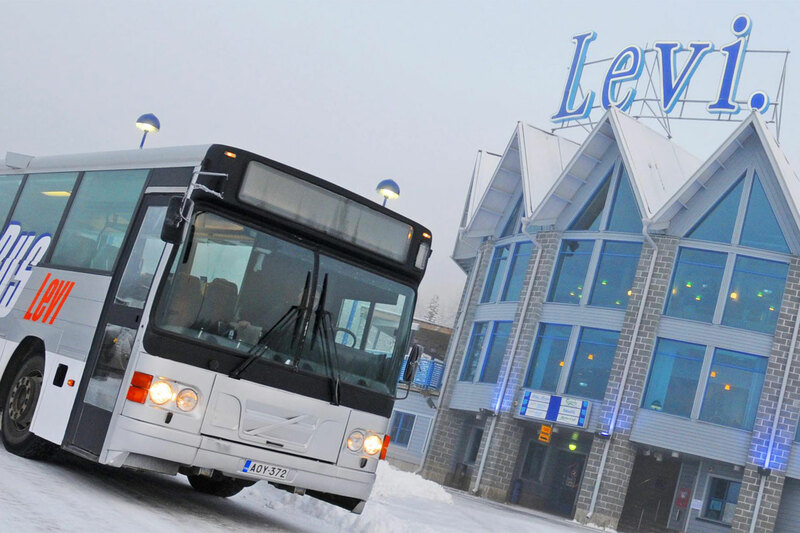 The Levi Season Passes and the Company Passes always include free-of-charge use of the Ski Buses. You may also buy bus tickets in advance from our webstore! Levi Season and Company passes include the right to use Ski Buses. 3,00 euros/ day Area ticket which requires a valid ski lift pass and is sold ONLY at ski pass offices. 4,00 euros/ day Advance ticket that is sold at ski pass offices, webstore, Levi Info and hotels of Levi. 4,00 euros One-time ticket that is sold only in Ski Buses. 41,00 euros/ season Ski Bus Pass that is sold at ski pass offices and in Ski Buses. No limitations for the use during winter season. Children under 6 years travel for free with adults. Prices include VAT. Rights for changes reserved. There are two routes which connect at the Zero Point building at the foot of the Front Slopes. R1-route operates from Zero Point via Northeast Slopes (Lift 6) and Hossa to Sirkka school and further to road Muoniontie, turning onto road Myllyjoentie and continuing past Levin Portti back to Zero Point. R2-route operates south from Zero Point on the main road, towards South Slopes (South Point) where it turns back towards downtown using road Länsirinteentie, calling at the cabin lift area and then returning to Zero Point. The Ski Buses transfer between the main slopes and the major accommodation areas. There are two routes which connect at the Zero Point building at the foot of the Front Slopes. We reserve the right to changes. The schedules are approximations of departure times. The actual departure times may vary.